Blue whales are very rarely seen in the Southern Ocean and yet by using this technology scientists on a seven-week voyage to the Southern Ocean were able to collect 57 photo identifications, 23 biopsy samples and attach satellite tags to two of these colossal whales. The Antarctic blue whale barely escaped extinction during the industrial whaling era in the 1900's when around 340,000 whales were slaughtered. Lead marine mammal acoustician, Dr Brian Miller, said Antarctic blues have a very deep and resonating song which can be picked up hundreds of kilometres across the Southern Ocean. The acousticians made 626 hours recordings in the sample area, with 26,545 calls of Antarctic blue whale analysed in real time. The researchers were then able to triangulate the position of the whales from their vocalisations and direct the ship to the target area. 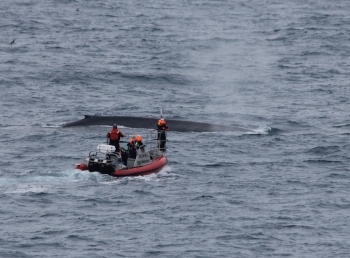 A team in a small boat was then deployed to gather skin biopsies and photo identifications from the whales. Whale tagger, Dr Virginia Andrews-Goff, said the researchers were able to deploy satellite tags on two blue whales. The tags transmitted never-before obtained data on rapid longitudinal movements during their summer feeding season and their foraging behaviour in relation to the edge of the Antarctic ice. This method of studying Antarctic blue whales has been so successful it will now become the blueprint for other whale researchers across the world.